then the sketch at Tuesday Morning Sketches these were my base and began to build from there. 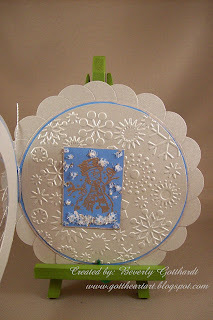 I just love that chunky art glitter that I got at Gotta Scrap and now with Christmas coming on I will really be able to use the Gala Glitz-White a lot. One reason I used the chunky glitter is because it goes with the Word of the Week Challenge--which is: furfuraceous: consisting of or covered with flaky particles. I never could wrap my mind around last weeks word, but I think I hit this one pretty good. There's a bird on the snowman's right hand and there is holly on his hat, as you read my challenge list you'll know what that pertains to. Supplies: Card Stock from my stash, Stamps: See Dee's-#50316 Traditional Christmas, #50315 Fun Christmas, Inkadinkado-97734 Warm Holiday Wishes, Ink: VersaMark ink pad, CTMH-silver embossing powder, Art Glitter-Gala Glitz-White, Fiskars Super Size Circle templates, Grafix printable transparent sheet, ribbon-Hobby Lobby, tiny silver brad, Stampin Up-1" circle punch, Sharpie Poster Paint pen-Silver, Cuttlebug embossing folder-Snowflakes, Spellbinders Nestabilities-Standard Circles Lg. Really cute card, love the whole layout of the card. Thanks for playing at MCFC. Wonderful card and I love the Acetate window. Thanks for joining in with MCFC this time, good luck! Absolutely gorgeous! Thank you for joining us at Tuesday Morning Sketches. 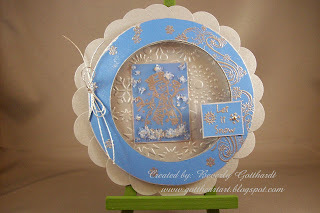 Beautiful card very unusual the acetate is a great idea. Thanks for taking part at the Crafty Creations 'Snow' Challenge! Great card! Wow! This is just crazy BEAUTIFUL! LOVE IT! This is lovely the blue and the snowman image. The shape is great too. This is gorgeous! Round cards are so lovely and yours is simply fantastic :) That shimmery paper is awesome. Fantastic card Beverley love all the elements and great embossing. Thanks for joining us for our latest challenge over on MCFC and goos luck. Hiya, love the colours in this. The whole design of the card is fabulous.